Described as a "crossover," the Audi Q5 is larger and higher than a hatchback, while generally smaller than a full-sized sports utility vehicle. The SUV crossover model is one of the hottest commodities of any body style being purchased today. 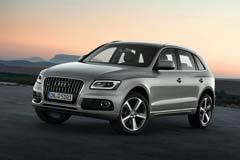 Buying a used Audi Q5 combines this design with the quality and luxury features of the brand. Perhaps the best way to describe an Audi Q5 is to an over-sized Audi A4 sedan with many comparable features. It is actually larger than many of its competitors in the market segment with just as much cargo space and a roomier interior. This 5 passenger mid-size crossover is offered in 3 trim levels: Premium, Premium Plus and the top of the line Prestige. You will find features that are normally optional as standard on a used Audi Q5. These include heated side mirrors, 8 way adjustable power front seats and a 10 speaker stereo system. Under the hood of a used Audi Q5 you will normally find a 3.2 liter, V6 capable of 270HP. It will be mated with a 6 speed automatic transmission. Quattro all-wheel drive is standard.